Info Senator John Ensign has served the people of Nevada from his days as a veterinarian, small business owner, and U.S. 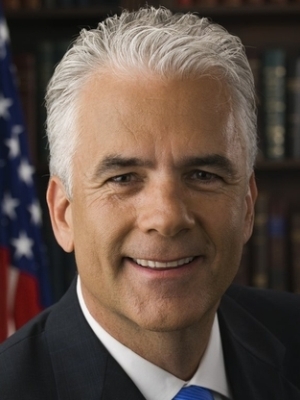 Congressman to his present role as the 24th U.S. Senator for Nevada. Senator Ensign was raised in northern Nevada and moved to southern Nevada where he graduated from Clark High School. He attended UNLV and earned a Bachelor's degree from Oregon State University. He received his Doctor of Veterinary Medicine degree from Colorado State University in 1985. Senator Ensign immediately began practicing veterinary medicine and opened the first 24-hour animal hospital in Las Vegas. Senator Ensign was elected to the U.S. Senate in 2000 and serves on the following committees: Armed Services; Budget; Commerce, Science, and Transportation; Health, Education, Labor, and Pensions (HELP); Small Business and Entrepreneurship; and Veterans Affairs. Ensign is Chairman of the Readiness and Management Support Subcommittee of the Armed Services Committee. In addition, Senator Ensign chairs the High Tech Task Force and serves as Vice Chairman of the Republican Steering Committee, a group that shapes the party's legislative agenda. Since taking office, Ensign has worked hard to fulfill his promises to the people of Nevada. His Education High Growth Grant amendment, which brings tens of millions of extra dollars to Nevada schools, was included in the education bill signed into law by President Bush. The Prescription Discount Card for Seniors, a key part of Ensign's prescription drug plan, was endorsed by President Bush and would allow many seniors to cut their prescription drug bills by 40%. On the environmental front, enactment of the Ensign/Reid Clark County Lands Bill will protect environmentally sensitive areas in southern Nevada, allow recreational opportunities to continue, and improve the quality of life. Ensign has taken the lead on technology issues as well. His "Dot Kids" legislation creates a subdomain on the Internet where children can explore the Internet without the fear of being exposed to material parents may deem inappropriate. His bill to delay the 700 MHz spectrum auction from moving forward was a critical step toward improving our nation's wireless network. Both were signed into law by President Bush. Ensign spends his workweek in Washington and his weekends in Las Vegas with his wife, Darlene, and their three children-Trevor, Siena, and Michael.